The new GW starter set for Tau is an amazing value and I would encourage anyone who has the spare cash to pick it up. More on that HERE. Aside from the amazing deal, it comes with a little bit of bait for those that can't stand to be left out of anything. It is an 'exclusive' formation: Ethereal Honour Guard. Now I know what you are thinking, "BS4 Fire Warriors! Honour Guard are back!" but you would be wrong. Sorry. Not that BS4 Fire Warriors are that cool anymore. We have so many ways of boosting accuracy it is almost unfair. So let's look at what this formation actually does. Required: 1 Ethereal on hover drone, 1 Fire Warrior Strike Team, and 1 unit of XV8 Crisis Suits. Bonuses: at the start of your movement phase you can "reform" a unit that starts within 12" of the Ethereal. Only one model in the unit has to remain stationary, the rest are redeployed within 3" of that model. Since the starter box has all the components for the formation, this means you can play with the starter box on its own with nothing else. Pretty sweet. Unless you wanted Breachers, then you are out in the cold. The bonus is nothing super amazing, but in a small points game (like maybe starter box vs. starter box) it could be huge. If you keep your models spread out, you could get some massive movement out of the bonus, especially considering that you can still move and run like normal after the redeployment. Naturally, this turns out to be a better defensive bonus than an offensive one, but it could help you get all your models within Rapid Fire range if the enemy is flanking your spread out mob. Imagine this: 12 strikers spread out in a huge line, the Ethereal attached on one side to act as bait. The whole line is 36" long. Your opponent doesn't take the bait and deploys his assaulty units in the center to minimize your escape. Let's say he gets within 12" of your center after he is done moving. You redeploy everything to one side. Suddenly you are more like 18" away from him even though he was ideally placed. Then you move 6". Maybe you even Run and use the Ethereal power to snap shoot at stuff. If your opponent doesn't know about your formation, and deploys opposite the Ethereal, he will go from 12" to 30" in an instant. Even if he inflicts casualties on the center, you can still redeploy before being forced to move back into unit coherency. Note: It isn't clear what happens if you can't fit everyone within 3" of the stationary model. Theoretically, you could run a full crisis team with drones that would definitely be too big, especially with the larger XV8 bases. Buy the kit for its value, not the formation. Then use the formation in some small games. You are most certainly bound to find a use for it, especially if you learn the art of spacing out your units early. Not really a formation worth taking in a large game or a tournament, but definitely a good one for small starter games. Good job GW. The models in the box set already make a CAD and then you can make one of your Fire Warrior teams into Breachers if you like. I think that is a better introduction to playing Tau than the slightly weird special rule that the formation gets. That special rule feels like one that will be useless in 80% of your games and then in the one game it does good your opponent will think it is really cheesy because of how odd it is. Naturally, you are free to make it into a CAD by running two minimum sized Fire Warrior teams. Especially if you want Breachers. However, Obsec is not as powerful of a bonus in games where there are only a few units on the board. As I said, it will likely only be useful in smaller games, but I forgot to mention it is also one of the only ways to get a single Ethereal outside of a CAD or the Hunter Contingent. None of the units are bad, so it isn't a "tax" like an Ethereal Council is. Notice that the Swift Redeployment rule removes models from the table. It does not MOVE them. This means it can be used on a squad that is in melee, as locked in combat only prevents movement. If you have a model out of base-to-base contact, and enough space around them, you can Swift Redeployment so that no models are in base-to-base. This does not end the combat immediately; combats end if no models are in b2b at the end of the phase. So the squad can't Redeploy then move, though they can run and jetpack boost in subsequent phases. Because consolidation happens several times on both sides (when the charge happens, each initiative step, and at the end of combat), you need to leave quite a long 'tail' to leave a model free. The post above me is complete cheese rules whoring and makes no sense whatsoever. Guys like that are why people refuse to play 40k with guys like that. My question with this is where can you play this formation? Can it be added to a CAD, Dawn Blade Contingent, or a Hunter Contingent? The reason I ask is because in the Dawn Blade Contingent and Hunter Contingent text it specifically states, "Only the datasheets listed here may be included in this Detachment." The Ethereal Honor Guard formation sheet doesn't mention anything about what contingent/detachment it can be added to. Since it is a special formation, does it over ride the text or can you only use it with the CAD? I didn't know you could even use formations with the CAD. Some clarification on this would be great! What contingent can the Ethereal Honor Guard formation be used with? 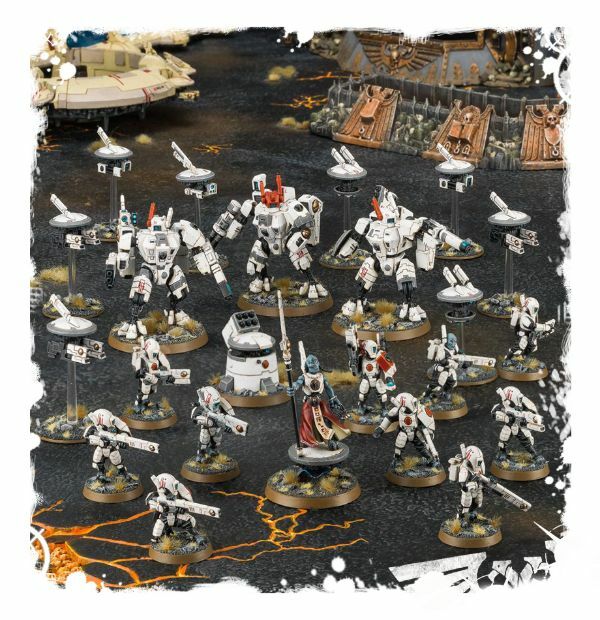 In both the main codex for the Hunter Contingent and in the Farsight Enclaves supplement for the Dawn Blade Contingent it states: "Only the datasheets listed to the right may be included in this detachment." So by this, does that mean we can only use it when building with the Combined Arms Detachment? Can we even use formations in the Combined Arms Detachment? Wasn't sure if this special formation overrides the above texts and is allowed in either contingent. Thoughts?